This was on Mel's blog and even though I wasn't tagged, I liked it because it was a very design-related Q&A! See the bottom of my list for who I have tagged! Favorite artist/designer: Charley Harper comes to mind. What inspires me: The world around me, Japanese design, etsy, and the incredibly talented and ambitious people I have met in the field of design. Favorite medium besides my own: I want to try Groco printing so badly! Most inspirational city: Being a small-town girl, I don't really have one, but one of my favorite travel destinations in the U.S. has been Boston. Ideal weekend off: Traveling to someplace new that I can explore and experience. Favorite color: Black is my old stand-by favorite, but truly, as an artist, I love all colors. Favorite musician: I like so many musicians. I honestly can't say - music is too mood dependent. Favorite song lyric: I always thought this was hilarious - "Smooth to the Groove like Sandwich Bread" from the song "Do Anything" by the band Natural Selection. It was a 90's thing! Melissa over at www.operationnice.com has posted her weekly nice assignment and I loved it so much, I had to participate. Check out her assignment and the site! I love my husband for always telling people that I am talented and amazing - it makes me blush sometimes, but I'm always so happy that someone believes in me so much. I love my mom for being such a nice and nurturing mother. I love my dad for all the great nick-names he had for me - I really miss him calling me "twinkle toes" and "Tootsie Pop". I love my brother for being my art mentor. I love my cat for being such a good cuddle-buddy. I love my best friends because no matter how busy we get, we can always get in touch and start right where we left off. I love my designer friends because they inspire me and understand me. 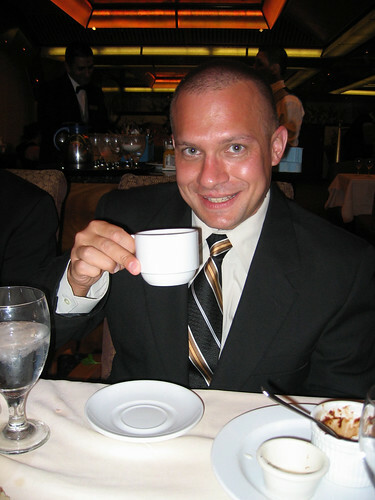 I'm finally getting a chance to blog about my cruise last month! I have been exceptionally busy since long before we went on vacation, so I without further ado, let's take a look at the Caribbean! Why: Because life needs vacations. It was beautiful! Probably the most beautiful water we saw on our entire cruise. Patrick went scuba diving with his friend Jeremy while I hung out with the girls and did a little shopping. I got some silver earrings and after we met up with the guys at Carlos & Charlies - that is one crazy place. Before you knew what hit you, the guys that work there are practically forcing you to get up and dance. 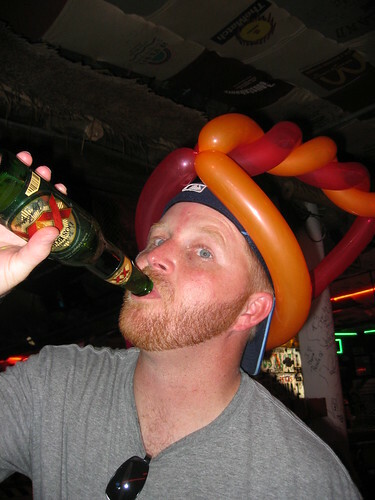 And before you know it, you have a balloon hat on and you're doing the YMCA. In the shopping area of Cozumel, a guy was set up with all these birds. For a donation, he would take your photo with the birds. Several different poses. It was all supposed to go to conservation efforts for the birds. It was really cool! 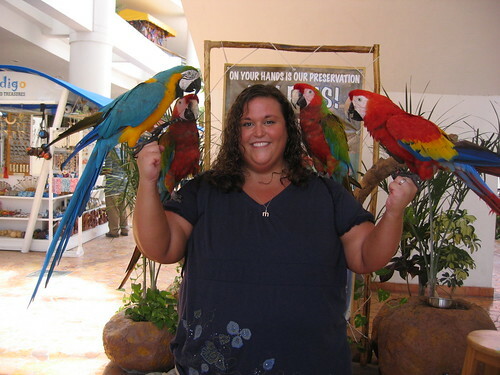 Those birds are heavier than they look! This was pretty cool too. 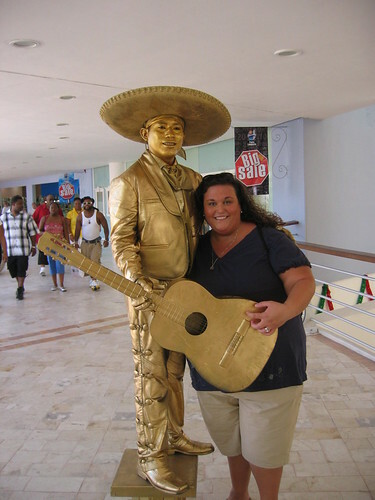 The Golden Mariachi guy wasn't even breaking a sweat and it must have been 110 degrees in the shade in Cozumel! Our friend Jeremey poses at Carlos & Charlies. You can see more Carlos & Charlie's madness on my flicker page. The days at sea were relaxing. It was time for sleeping in just a bit and checking out all the amazing food. The fancy dinner nights were also after the days at sea, so you had plenty of time to get ready. Patrick all dressed up at sea. Pinkies out! Now, that's fancy! Here is the entire Barr party of 8 at dinner! Fancy! 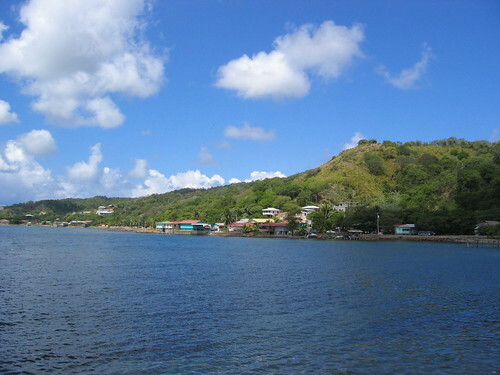 Our plan for Roatan, Honduras included the Jolly Roger excursion to Gumbalina Park and then a Catamaran snorkeling trip. The park was pretty cool! We got to hold and play with a monkey. Monkeys are awesome. The snorkeling didn't go so well for me because the water was a bit rough, and I'd never snorkeled before. This wasn't exactly a beginner snorkel tour. So, after being totally freaked out, I got back on the boat and relaxed a while and got some sun. On our way to the park. Lots of great views in Roatan. 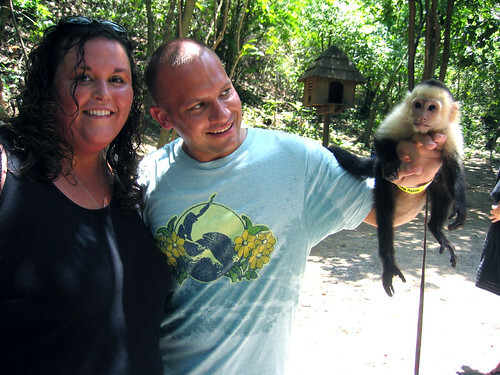 Patrick and I with the lazy monkey. He was pretty amazing. 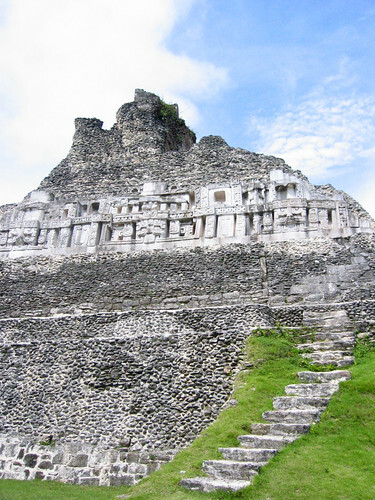 Our excursion for Belize was for the Mayan ruins of Xunantunich about a 2 hour drive from port. On our way there, the tour lady gave us all the background of Belize. It's pretty interesting. The official language of Belize is English. They have several Amish (German, American, and Cananadian) communities there and we saw an Amish guy selling produce on the side of the road. Very interesting culture. Modern in areas, but the ruins were near a river where the village women still wash their clothes. We saw huge iguanas in the wild and we also saw some Howler monkeys hanging out in the surrounding area. We were less than one mile from Guatamala. This was my favorite excursion of the trip! A truly amazing site! The steps on this thing are HUGE. Many of us had to climb up on hands and knees because each step is about 3 times as high as a normal step. This is the largest pyramid "El Castillo" or The Castle. It stands 130 feet in the air. I wasn't terribly impressed with the excursion selection at the Bahamas, so we went to an "all-inclusive" resort. The beach was rocky, the food wasn't cooked, and there were people trying to sell us crap. We weren't really happy about it, but I still had a great time on this cruise and that experience won't stop me from going again. If you go on a cruise, get your portrait made! The quality is excellent, and you'll never be able to get professional photography at this low of a price! Patrick and I had ours made and bought these prints.